iMacsoft iPod to Mac Transfer, the excellent Mac iPod transfer software, is specially designed for Mac OS. It can fast transfer, rip, copy and manage your Music, Movie, Photo, ePub, PDF, Audiobook, Voice Memo, Podcast and TV Show from iPod to Mac, iPod to iTunes, iPod to iPod and Mac to iPod transfer is also available. With installation of iTunes, iMacsoft iPod to Mac Transfer can even transfer music, videos, photos and so on between your iPhone and iPod. 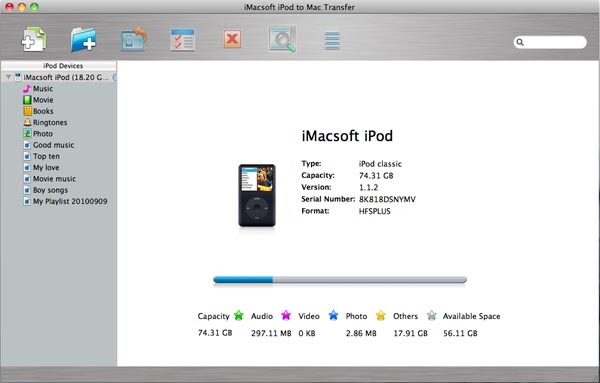 iMacsoft iPod to Mac Transfer can manage your iPad, iPhone or iPod touch like an external hard drive. Also you will find that quick search and filter tools help you hit what you want as easily as iTunes does. Your iPod, your way. The iPod to Mac Transfer provides an ideal solution for you to manage, rip, copy, backup iPod, iPad or iPhone on Mac. Free download iMacsoft iPod to Mac Transfer and put control of the iPod back in your hands now! Fully supports the latest iOS 8 and iTunes 12. Transfer iPod Music, Movie, Photo, ePub, PDF, Audiobook, Voice Memo, Podcast and TV Show from iPod to Mac at high speed. Transfer iPhone SMS, Contact, Call List from iPhone to Mac for backup at high speed. Copy your iPod Music, Movie, Photo, ePub, PDF, Audiobook, Voice Memo, Podcast and TV Show from iPod to iTunes library directly. Filter and Quick Search tools are provided for you to find what you want quickly and easily when you transfer music and videos from iPod to Mac, iTunes library, other iPods, iPad and iPhone. How to transfer music from iPod to Mac? How to manage iPod content without iTunes on Mac? How to export iPod music to iTunes library on Mac? How to transfer iMessage from iPod touch 4 to Mac local? How to copy songs/movies purchased from iPod to iTunes library? How to add music to iPod without iTunes on Mac? How to transfer audio books from iPod touch to Mac? How to export voice memos from iPod to Mac? How to transfer iPod touch camera roll to Mac? How to sync an iPod without deleting the old music? How to backup iPod touch downloaded podcasts to Mac? How to Transfer iPod purchased songs to Mac? How to sync iPod music/video to another iPod on Mac? How to transfer iPod music/video to iPhone 4 library on Mac? How to transfer iPod music/video to iPad on Mac? How to add music to iPod, transfer iPod video to Mac, sync iPod videos to iTunes? How to copy photos to iPod library on Mac (without iTunes)? How to transfer ePub/PDF books to iPod iBooks? How to mount iPod as hard drive on Mac?